This is my largest project to date, covering 96 square feet. 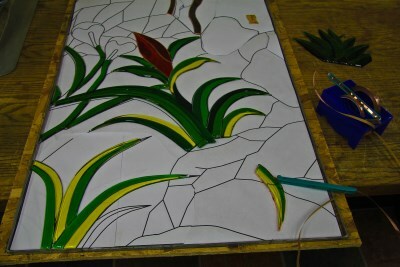 The panel contains 923 pieces, of which 169 were painted and kiln-fired two to four times, and of which 275 were fused. The leafy pieces are double plates. The home's architect and builder is Kenneth Lane. Several ideas came to mind during the design phase. Considerations included a modern sunburst with brilliant colors or possibly a monochromatic forest. After studying works of other artists, I decided on a lake with a distant shore with flowers and a gaping tree in the foreground. Tiffany did a lot of similar projects. 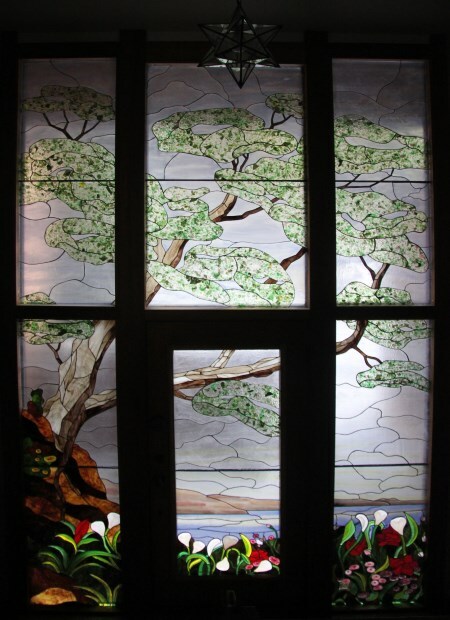 A major development in stained glass technology occurred in the late fifteenth century: paper began to be used for design layout. 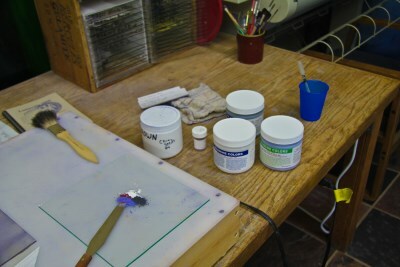 Previously, cartoons were laid out on whitewashed tables. What a challenge! A subsequent notable innovation occurred in the late twentieth century: Dragonfly Software introduced Glass Eye 2000. This project would have lingered perhaps twice as long without it. From conception to completion, Glass Eye 2000 was a lifesaver. Some of the cool features include experimenting with different color patterns, expanding or contracting elements, and the flip function. Cutting, modifying, reversing, and then pasting greatly facilitated flower design. A compliment I often hear is that my designs have a "gentle flow." This comes naturally with Glass Eye 2000. Just lay down three points, and you have a gently flowing curve. Push a button, and it all plots out. Don't mess with taping numerous 8.5" x 11" pages together. It's easy to find older and very reasonably priced plotters. I purchased a great 36" HP plotter for under a hundred dollars. 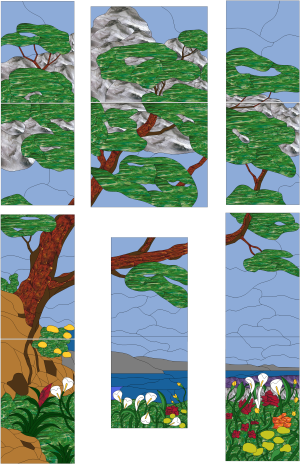 A major fabrication concern was that each of the twelve panels needed to fit exactly into the window frames. I accomplished this by first making a frame for each glass panel with 1/8" x 3/8" zinc flat bar. The corners bent easily. A 300-watt soldering iron, equipped with a thermocouple and PID controller, was used to solder glass to the frame. Joint soldering was accomplished with two 100-watt Weller soldering irons. One was equipped with a 700? tip and the other with a 600? tip. The back side was soldered with 50/50 solder and the 700? tip, and then the front side with 60/40 solder and the 600? tip. A trick I figured out is that when soldering the reverse side, elevate it a little. Checkers work well for this. Then if solder seeps through to the underside, it doesn't flow out and make a mess. 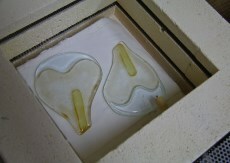 It remains in a nicely contoured bead, or at worst a drip that can be easily removed. The flowers were fun. The lilies were my innovation. They consisted of five pieces, fused together at 1450? with paint in between the layers. Then a final coat of 60% white paint, and 40% flux was fired on the back side at 1250?. They turned out super! 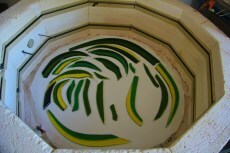 Leaves were fused in a 22" kiln, modified with heating elements attached to the lid. The design has numerous clouds. 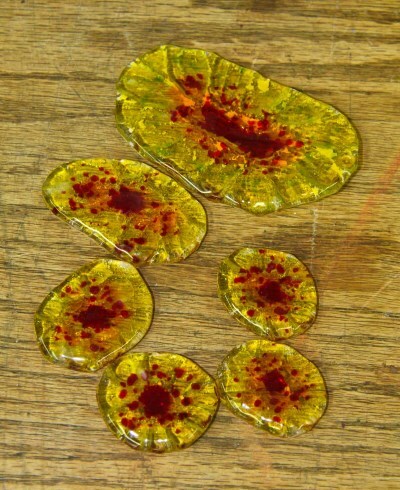 To keep the colors uniform, ingredients of each color were measured to a hundredth of a gram. 0.3ml of water was added for each gram of color. I cleaned off flux with window cleaner. I feel sorry for anyone who continues to use whiting because it's too messy. Formula 1 carnauba wax worked great for the final touch. Born in San Diego, California and currently living in the mountains near Salt Lake City, Utah, Peter Ruplinger is an avid outdoorsman and devoted husband, father, and grandfather. His art is inspired and guided by the beauty and geometry of nature and the world that surrounds us. Much of his early work draws upon the influence of Diego Rivera, Claude Monet, and Paul Gauguin. 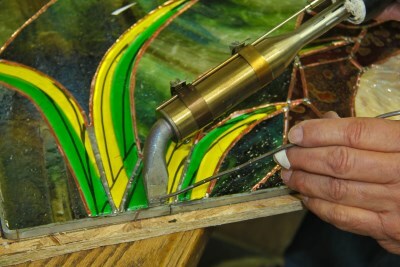 From the great cathedrals of Europe to humble Mexican churches, Peter has had a lifelong love for works of stained glass. He underwent a traineeship in Zurich, Switzerland and studied stained glass design and fabrication in Cl?gu?rec, France. 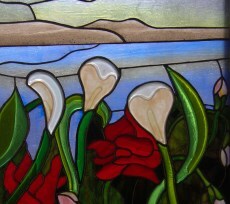 Peter's work has been exhibited in the San Diego Museum of Fine Art, Davis County Courthouse, and Davis County Administration Building. 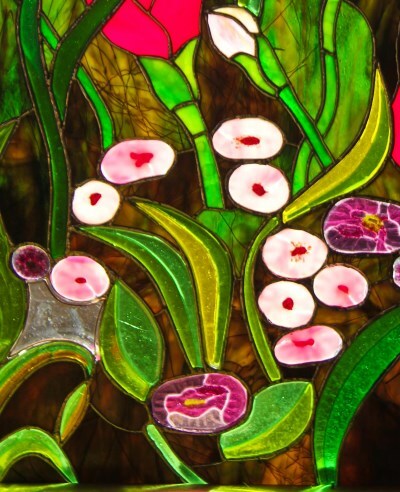 It is on permanent display in the Farmington Library and lobby of Corning Glass, Bio-Science Division. Visit Peter's website to learn more.